When exactly did oxygen first appear in Earth’s atmosphere? Although many physical and chemical processes are thought to be responsible for that profound transformation, scientists have tried to answer at least part of that question by looking for the origin of oxygenic photosynthesis — the process that organisms use to split water to make oxygen — in rocks that are billions of years old. One way they try to pinpoint the start of that process is by searching for biological links between the distant past and the present. Specifically, they study molecules known as biomarkers that are produced by modern organisms and can be traced to the origins of certain biological processes because they are found in rocks that are 2.5 billion years old. One biomarker that had been proposed for such research is a type of lipid, or fat molecule, known as 2-methylhopanoid. This substance was thought to be a good biomarker because it has been found in ancient rocks (where it is referred to as 2-methylhopane) and is also produced in the modern environment by cyanobacteria, which are oxygen-producing bacteria located in shallow marine environments. But it turns out that these molecules might not be the best biomarkers for oxygenic photosynthesis, according to a recent collaboration between MIT’s Department of Biology and Department of Earth, Atmospheric and Planetary Sciences (EAPS). In a paper published in the Proceedings of the National Academy of Sciences, the group reported it had discovered the gene and related protein that are responsible for producing 2-methylhopanoids. Because this DNA can be traced to bacteria that do not produce oxygen, 2-methylhopanoids cannot confidently be used as biomarkers for oxygenic photosynthesis, the researchers say. The research, which was supported by NASA, the National Science Foundation and the Agouron Institute, counters previous work of co-author Roger Summons, an EAPS professor of geobiology, who first proposed in 1999 that 2-methylhopanoids could be a biomarker for cyanobacteria. That work was called into question in 2007 when researchers in the lab of co-author Dianne K. Newman, the John and Dorothy Wilson Professor of Biology and Geobiology, in collaboration with Alex Sessions at the California Institute of Technology, discovered a type of bacterium that doesn’t produce oxygen but does produce 2-methylhopanoids. To determine whether this was a chance finding or whether different kinds of bacteria produce 2-methylhopanoids, Summons, Newman, Sessions and several postdoctoral researchers joined forces to figure out which genes and proteins are involved in making the lipids. Knowing this gene, the researchers could then search the genome databases for other bacteria that also produce these molecules. They could also learn more about the purpose of the molecules, such as whether they emerged in response to some sort of environmental stress billions of years ago. “This is an excellent example of how genes themselves can also be used as fossils,” said lead author Paula Welander, a postdoc from Newman’s lab, who explained that previous surveys of bacteria that produce 2-methylhopanoids were limited because they were done in the laboratory under arbitrary growth conditions which did not necessarily elicit their production. Moreover, because there are lots of bacteria that biologists can’t yet grow in the lab due to technical limitations, this means they might not be aware of some that can produce 2-methylhopanoids. By taking a molecular genetics approach to analyzing lipid production, the group was able to circumvent these limitations. Ann Pearson, a biogeochemist at Harvard who was not involved in the research, said that although scientists still have a long way to go before understanding the earliest origins of these biomarker molecules, the discovery of this DNA is “crucial” because now scientists know where to look as they start to “fill in the holes” about the earliest history of oxygenic photosynthesis. What makes 2-methylhopanoids unusual from other lipids that are produced by bacteria is that they have an extra methyl group (one carbon and three hydrogen atoms). To determine which gene and protein are responsible for adding the methyl group, the MIT researchers analyzed the genome of the bacterium that Newman’s lab had previously discovered also produces 2-methylhopanoids. Once they found a gene cluster that is responsible for making lipids, they generated mutants with deletions in genes encoding proteins likely to be responsible for adding the methyl group. 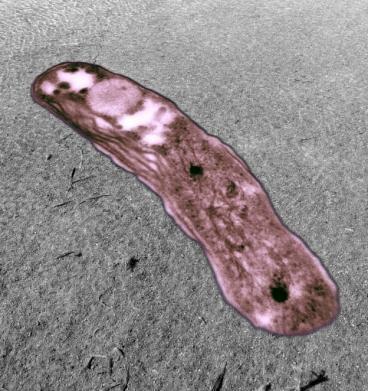 After pinpointing the gene that encodes this protein, they searched the genome databases to determine what other types of bacteria contain this specific gene. It turns out there are three major groups containing many bacteria, including cyanobacteria, but the researchers were not able to trace the complex history of the protein to determine which bacteria carried the oldest version. In addition to determining this history, the researchers are trying to decipher the function of 2-methylhopanoids, which could reveal something about what microbial life and its environment were like on Earth billions of years ago. They are currently conducting microbiology and molecular biology experiments to examine the features of membranes that contain the molecules, and they are also researching the environments where these molecules are found today.